Imagine what your real estate agency could achieve with a set of tools to help you save time, money and stress. Sometimes, even the smallest of changes can bring about big benefits. As an agency owner, you most probably know the areas in which your team could work more efficiently, or your business could save on unnecessary costs. But with so many tools on the market, finding the right ones is most often the biggest challenge! We’ve come from your side of the fence, so we appreciate those little things that cause a daily nuisance, but seem too small to bother fixing. We also know how investing in good accounting software can take the pain of accounting away (almost) completely. Before we get onto the below sections, it’s probably a good idea to bring you up to speed on the Cloud, if you aren’t already. We wrote a blog post some time ago about how the Cloud could bring about endless benefits for your real estate agency. You can read the blog post here. If your agency is still muddling through the finances with an Excel spreadsheet, it might be time to re-assess. Excel isn’t an accounting tool and has limitations that more than out-weigh the investment required for good accounting software. Aside from the potential for human error, using any kind of manual system such as Excel spreadsheets will cost hours in time and no doubt lead to nasty GST mistakes that need rectifying at year-end. Instead of fighting fires, why not dedicate this time to forward planning? If you’re thinking of upgrading your accounting system, definitely don’t look past Xero. 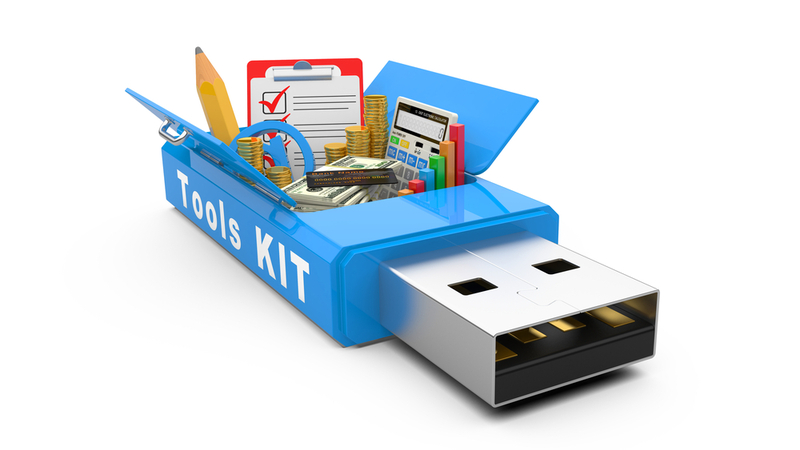 It’s packed with tools and intelligent features that will work wonders for any small business. The key features include sharing the accounts with your team and accountant, connecting your books with your bank accounts, automated billing, integration with add-ons such as PayPal and CRM systems, financial reporting and also an interface that translates across your PC, tablet and mobile for on-the-go admin! If your team is using Microsoft Office for email, documentation, spreadsheets and presentations, take a look at Office 365 – it’s the perfect solution for taking work wherever you go, sharing team documents, looking professional to your clients – whilst having the reassurance that your work is sitting safely in the Cloud. Subscription is fairly reasonable, starting at around $15 a month depending on how many licenses you need. Dropbox is a ridiculously useful tool that helps you store your files and folders in the Cloud, so that everyone can use it. You can send links via email to folders or documents, both internally and externally. It’s great for large file sending and best of all…it’s completely free! If your team is using iPads for work, the Quick Office Ipad app is invaluable. It enables you to make basic edits to Word documents from the Ipad, send them on or save them to your Dropbox account – a great example of how the Cloud can bring many programs together and create more seamless working for your team. If you’re using social media for your agency, you should be streamlining your activity with software like HootSuite. This way, you can control everything on one dashboard and save time switching from account to account. Mail Chimp is a great (and free) email marketing platform to help you look professional to your clients, segment your database lists and keep your valuable data clean. For those of you who tend to shy away from technology, it’s extremely simple to use too. Vimeo and Slide Share are great resources if your agency uses PowerPoint presentations or video. Vimeo is great for hosting your videos (as a modern alternative to YouTube) and Slide Share enables you to upload presentations and share them with your staff or clients. Shutterstock is our go-to resource for images – for our marketing material, but mainly for our weekly blog posts. Last Pass is a genius (and free) password manager that enables you to log-in seamlessly to your regular accounts and websites, to save you hours each month in scrambling for passwords. Website hosting can be frustrating – bad customer service and a ticketing system at the best of times. When your agency’s website experiences downtime, it’s time to change your website hosting company. We’ve been around the block a bit and head and shoulders above the rest we think is Digital Pacific. There’s an endless number of tools, tips and tricks, the list goes on and on – but recommendations are always useful! For more advice – on any aspect of running your real estate agency – get in touch on 1800 003 569. Enjoy this post? Then please share it using the buttons to your left or below!